The Standedge line is packed to capacity on both counts. In the peak hours – and on a number of journeys outside the peaks – its Sprinters and Pacers are packed to the gunwales. Even with 4 cars. The line itself is the busiest it has been in recent history with five train movements per hour. Services have risen in popularity, being a cheaper and faster alternative to the bus. Thankfully, something is being done about this thanks to forthcoming electrification works. Unfortunately, for its beleaguered passengers, five years is too long a wait with completion slated for 2018. Obviously, 2016 – 2018 would mean disruption to services. It may mean delays to the existing stopping service – if the all stations train remains in operation. Instead, one suggestion – a cheap way to increase rolling stock capacity whilst not affecting running times and track path availability – the skip-stop service – had been mooted. In a Transport for Greater Manchester report regarding rail strategy, it was suggested that the Manchester – Huddersfield all stations trains could operate twice hourly along the route in full. If you look in to the details properly, frequencies between Mossley and Huddersfield will remain once hourly, though there would still be two local trains per hour. The shape of things to come – unless we know otherwise, or course. The orange line denotes the Stalybridge – Wigan Wallgate – Kirkby service. The darkest blue refers to the Transpennine Express routes, likely to use Piccadilly and Victoria stations in 2016. Please note, this example is purely for show and does not reflect the 2016 timetable. Greenfield passengers would have to change at Stalybridge to get to Mossley, increasing the five minute journey to about 20 minutes, allowing for connection times. Therefore, this development would make First Greater Manchester’s 350 and 354 services a more attractive option. 30 minutes is allowed on the 350, 353 and 354 from Ashton to Uppermill! Walking along the Huddersfield Narrow Canal would be more attractive, so long as you haven’t got heavy luggage. In the opposite direction, a journey to Marsden would require changing at Huddersfield! Therefore, for Greenfield passengers, the Standedge Tunnel Tax would be even bigger. Instead, passengers would be better off catching the 350 to Mossley to meet up with the Marsden train, or board First Greater Manchester’s quicker alternative, which is the 184 route! Equally contemptible is the loss of its link with Ashton-under-Lyne. At least passengers would have the joy of changing at Stalybridge, for the other skip-stop train, or the weekday service to Kirkby. Or they board the 236/237/348 buses outside the railway station. Again, another short journey turned into an omnishambles of connecting buses or other trains. The one move which has riled Greenfield rail passengers is the decision to terminate their local services at Manchester Piccadilly. It is claimed that most passengers prefer Victoria, owing to its proximity to Manchester Arndale. On the other hand, there is one gain where passengers heading to Stockport, Birmingham or London Euston wouldn’t need to cross the city centre, or change at Stalybridge for a Piccadilly train. Though the omnishambles may be in place for two years, one wonders if there’s a whiff of conspiracy theory or three about this development. 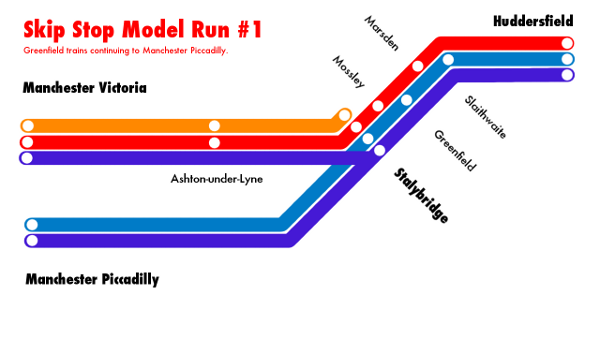 One possibility: to boost ridership numbers on First Greater Manchester’s routes. Another one: to rinse more money from its commuters to pay for the electrification work. With the latter, the skip-stop approach, whilst used to increase the number of stopping services from Stalybridge to Huddersfield, may see a marked increase in fares for Greenfield commuters. A trip to Mossley might warrant a 110% fare increase in 2016 or 2015 levels (with the need to change at Stalybridge). A trip to Marsden, 70% up on similar levels via Stalybridge, or 150% up if via Huddersfield. Supposing skip-stop services go ahead, we hope this isn’t the case (but if it does happen, remember where you heard this claim/conspiracy theory first). Hopefully by then, Greater Manchester’s answer to the Oyster Card should be circulation, giving passengers greater ability to change between bus/train/tram without financial penalty for changing modes. Train from Mossley to Ashton-under-Lyne or Manchester Victoria. Please note that the above routes and pubs may be subject to change by 2016. Whatever happens, I don’t think the skip-stop system would work at all between Stalybridge and Huddersfield. Local services aren’t frequent enough to warrant its usefulness. Anything of similar frequency to a Metrolink service would be useful, particularly on the Oldham Loop Line where semi-fast services could be restored. With a Metrolink style frequency, transfers to other stations would be more painless, compared with a 30/60 minute one on heavy rail services. It is worth noting that the pairing of the skip-stop stations may vary from the ones denoted in this article, so East of the M60 will keep you updated on this nearer the time. I favour the half hourly service proposal suggested by the Slaithwaite and Marsden Action on Rail Transport and Greenfield Rail Action Groups. Supposing this is impossible during the electrification works, then the existing stopping service should be retained, with 4 car trains as standard – all day weekdays and Saturdays. Perhaps Greenfield may get its half hour service once electrification is completed, and without The Shambles To Come. Even during Stalybridge’s engineering works, the shuttle service between Manchester Victoria and Stalybridge ran empty up to Diggle, reversing there before becoming its return counterpart. It may still be possible five years from now, but a fifth Transpennine Express journey per hour may scupper this. The ‘sparks effect’ of frequent daytime services in 1991 has seen the Manchester to Huddersfield route gain popularity. Hopefully, a real Sparks Effect in the technical vein may make just as great an impact. One which would see the Class 319s, scheduled for our area’s electrified lines, replaced by brand new trains. How else would you improve Greenfield’s rail services? Would skip-stop be a better stop-gap before electrification’s ready? Can you create fictitious timetables better than this fellow? Feel free to comment. The forseen Greenfield problem is not new where the railways are concerned. Even now and when the changes take place, it will be necessary for a rail passenger from Ashton to have to go to Stalybridge and change, to get to Piccadilly. The option of going to Victoria then the Metrolink to Piccadilly is no real option if you have luggage with you and are heading south. It is a similar problem to using the tube to change stations in London with baggage….to be avoided like the plague! I am coming over to Stalybridge this coming Monday, so may see you in the Buffet Bar one night. I too recognise that trend from past experience. There’s one passenger I know who used to board his train at Mossley, and changed at Stalybridge for the Manchester Piccadilly trains (one to Manchester Airport, second to Liverpool Lime Street). The area of greatest concern I had was how today’s simple one stop journey could be a temporarily more complicated one between 2016 and 2018. I hope the temporary spell – should skip-stop go ahead – would only be for the aforementioned two years. Would a rail replacement bus calling at all stations be preferable to skip-stop? The only problem with rail replacement bus alternatives, besides slower speeds, is capacity: for the carriage of passengers and luggage. Even with skip-stop, it may be more convenient for passengers to continue their ‘last mile’ journey by car or bus, meaning busier car parks through the former mode. With the latter, connections may be patchy between modes – unless bus/train/tram connectivity has reached Mainland Europe standards by 2016.
as someone who cares as a ‘Standedge train user per se’ and THEN as someone who uses the service for ‘business reasons in order to get to London efficiently’ and EVEN THEN as someone who uses service as someone who needs to commute from the Colne/ Holme Valley to main stops from East Mcr to Saddleworth’.. (because car or Bus use is …well…NOT an option!) all of these ideas are not viable. Ideas on how complain/ flag this up please!! At least with travelling from Huddersfield into London, you have three termini to opt for. Manchester way, Euston; via Wakefield Westgate, King’s Cross; or the scenic route via Barnsley and Sheffield, St. Pancras. Obviously, the machinations of National Rail’s ticketing system may suggest London Euston as the default station from Huddersfield, though it could be possible to split your tickets at Wakefield Westgate or Sheffield if you wish to pursue alternative methods of getting to London (it may be marginally, or substantially, cheaper than the direct bog-standard peak hour fare). Have you come across SMART? SMART is Slaithwaite and Marsden Action on Rail Transport. They are a user group in the same mould of the Penistone Line Partnership (link: http://www.smart-rail.co.uk). There is also reference to SHRUG on their website. SHRUG is the Stalybridge to Huddersfield Rail Users Group, which could also be worthy of your attention. Personally I’m all in favour of Greenfield trains going to Piccadilly – suits me! Skip-stopping, as a temporary measure to increase capacity during the electrification process, has some merit in as much the the principal passenger flows from all local stations are to either Manchester or Huddersfield, so relatively few passengers will be affected, but one worries that it might create a precedent, and be left in place after electrification (what with TPE always wanting more slots and Alliance Rail wanting some). One measure of alleviation might be to revert to all stops hourly services in the evenings (and on Sundays) when the 184 bus doesn’t run. Otherwise I would think the 184 a perfectly adequate carrier of such Saddleworth – Marsden traffic as there is, and at £3.10 one way a damn sight cheaper. Oh, and if the skip-stopping consigns the Rail Ale Trail to the 7th circle of Hell, that’s fine by me. All right when it was real ale types seeking out favoured brews, but it’s all stag and hen parties now, who drink nothing but lager anyway. I’ve given up trying to use the train on Saturdays, except perhaps in the early morning. It’s just a mobile riot from noon on. I love your comment about the Rail Ale Trail being consigned to the 7th Circle of Hell. Ultimately, Northern Rail may be in that context besides the other often tiresome complaints about its trains. Apart from the hijacking by lagerboys and Stag/Hen Do types, it is crucial to Northern Rail’s viability of its off-peak Manchester Victoria – Huddersfield service (which is already popular without the Rail Ale Trail, owing to shoppers and it being a cheaper alternative to the bus after 0930 on weekdays). Though I thought of the skip-stop idea as a better non-rail replacement bus temporary (though undesirable as a permanent) solution, I had similar suspicions, given that TPE wishes to increase its Trans-Pennine services between Manchester and Leeds to 5 trains per hour. Not least Alliance Rail’s attempts to establish a London service. Over dinnertime, I was thinking of another way how skip-stop could be implemented. One train per hour all stations from Manchester Victoria to Marsden then Huddersfield, with the second one per hour all stations to Greenfield, then Stalybridge and straight to Manchester Piccadilly – possibly with an intermediate stop at Guide Bridge (for Glossop and Hadfield connections). Thus meaning Ashtonians have a choice of Piccadilly and Victoria stations. Therefore, this avoids a short drive to Guide Bridge or a change at Stalybridge for Piccadilly trains. What’s more, Ashton’s trams will continue to Eccles (via MediaCityUK), meaning a partial resurrection of the 64/66 SELNEC route to Peel Green. Not least a less traffic clogged way of getting to the Etihad Stadium or Old Trafford (alighting at Pomona, walking via Trafford Road Bridge).